Damn. It really is only yesterday’s post that is song-title-less!! 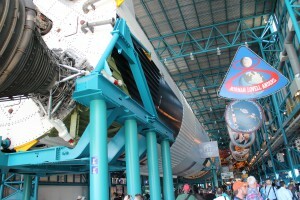 Today I drove accross Florida to the Kennedy Space Centre. To those who know my history with causeways, you’ll be pleased to know I managed to drive over NASA Causeway without causing any damage! I’d had a tiny splurge and booked a “behind the scenes” style tour which included the Launch control room. After that the bus pulled onto the main complex. The size of it was mind blowing. It’s got big main roads like the ones I’d driven to the space centre on! We headed for the Launch Control suite which happens to be situated next to the Vehicle Assembly Building. 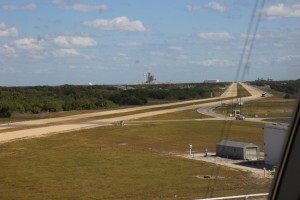 VAB and Launch Control…. It’s so much bigger than you can imagine! In the lobby the guide explained the evolution of the use of Cape Canaveral and now the Kennedy Space Centre and how the two are now often referred to as one or the other when in fact technically they are different things. 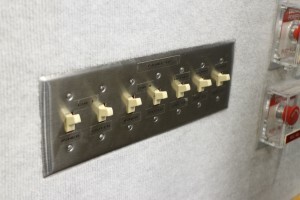 Lighting up the room which lights up the rockets! It’s all a bit 1960s. 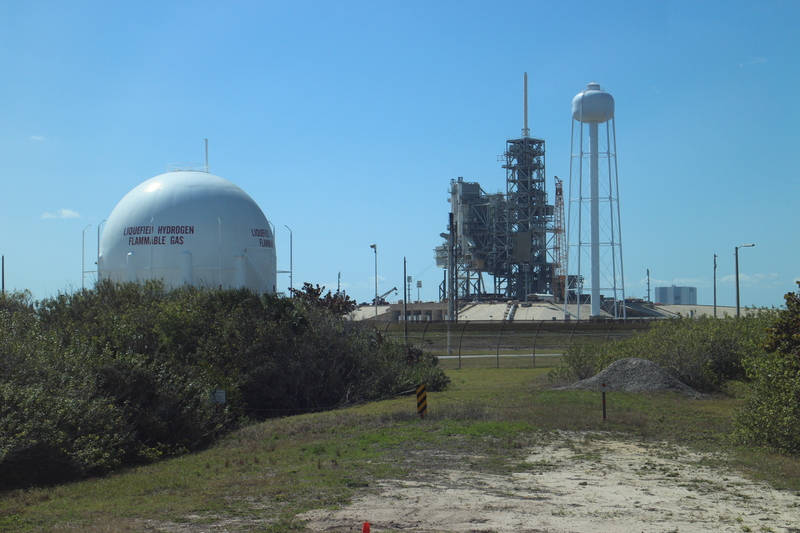 The Launch control building at Kennedy is simply out of date… It surprised me on one hand… but on the other hand I kinda expected it… Things have moved on since the Kennedy’s Golden days of space prominence. 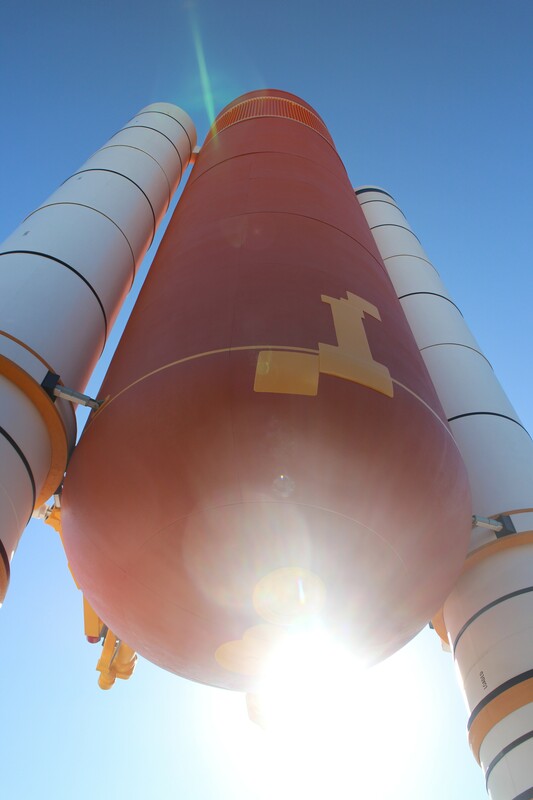 How to Fly a Space Shuttle: FOR DUMMIES. 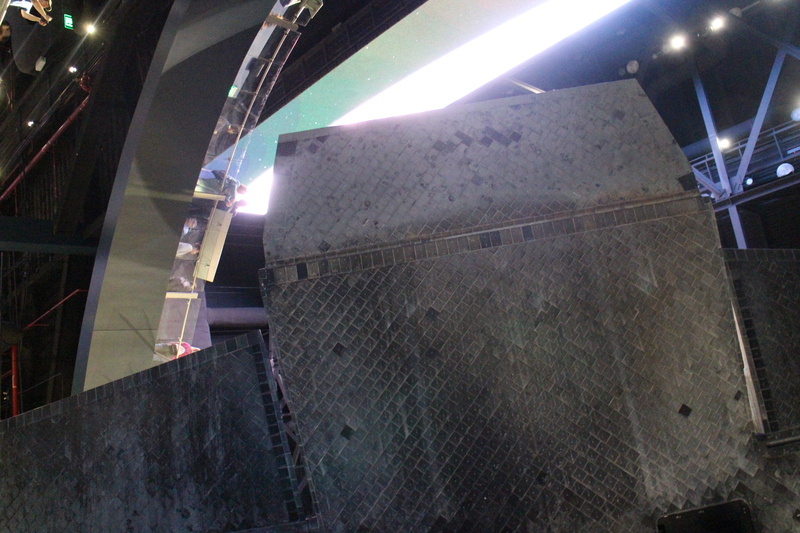 The view out of the Launch control room was pretty impressive. 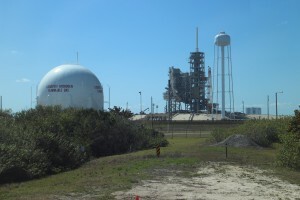 Views of a few of the modern launch sites and the surrounding areas…. 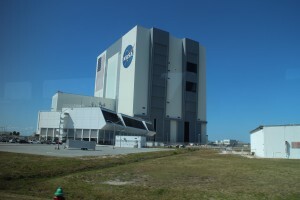 Nasa’s Kit in the front (Closest to the huge windows!) 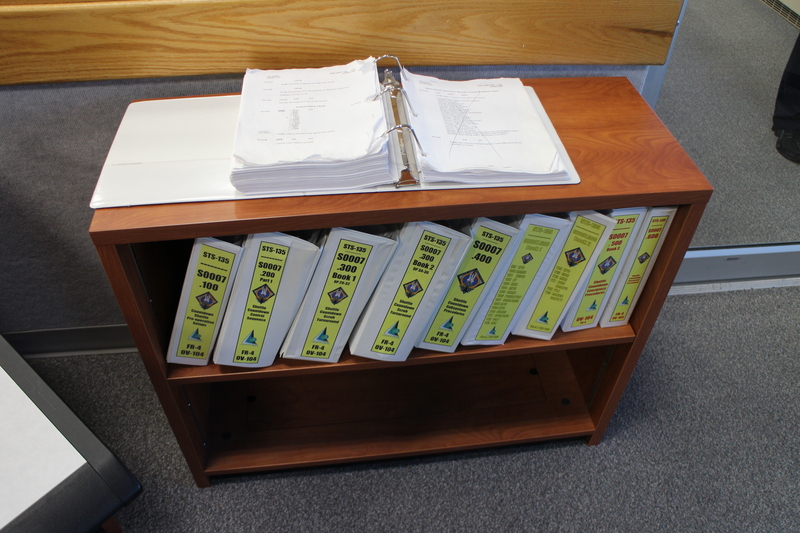 … and then the partitioned areas behind made for private companies. I was amazed by the detail of things we were being told… most of the information went in one ear, and blasted itself into space out of the other… but one thing did shock me and stay with me…. 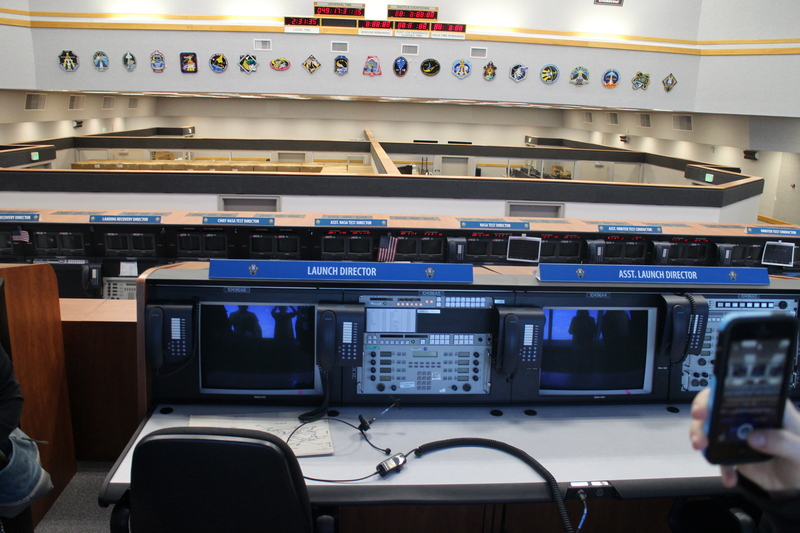 When launching a space ship, the Team at Kennedy only has control for the first 7 seconds of the flight before all control is switched to the control room in Houston. (Hence “Houston we have a problem”)…. Seven Seconds? That’s nothing! All this technology (however new or old) for Seven Seconds! That’s CRAZY! 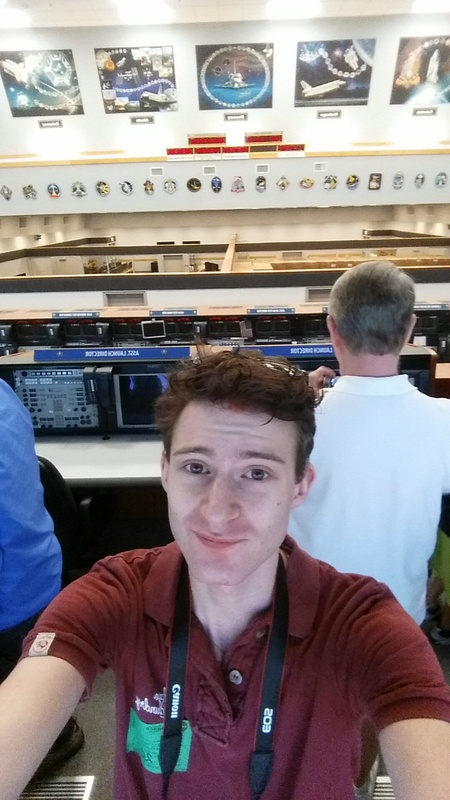 Before we left the Launch control room, I couldn’t resist doing….. 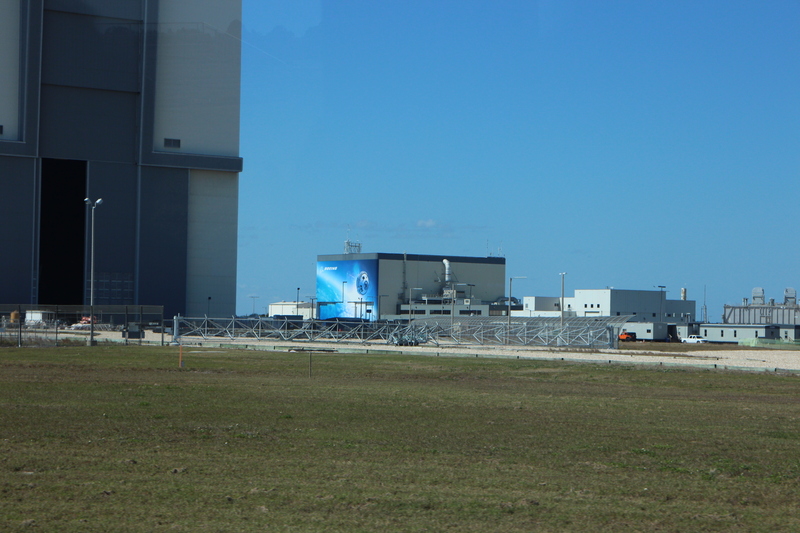 This is the Large… but in this photo seemingly small Boeing building on the site… Next to the VAB. Look how it doesn’t even reach the top of the lowest part of the VAB Doors! Boeing building is hiding just behind the white building in the foreground right! If that hadn’t really put the size of the VAB into perspective for me, then driving out and along the crawler-way sure would. This area, with something like 8 inches of top layer, specialist shingle (Specialist as they had to fly the rocks in specially as they were rocks that won’t spark!) 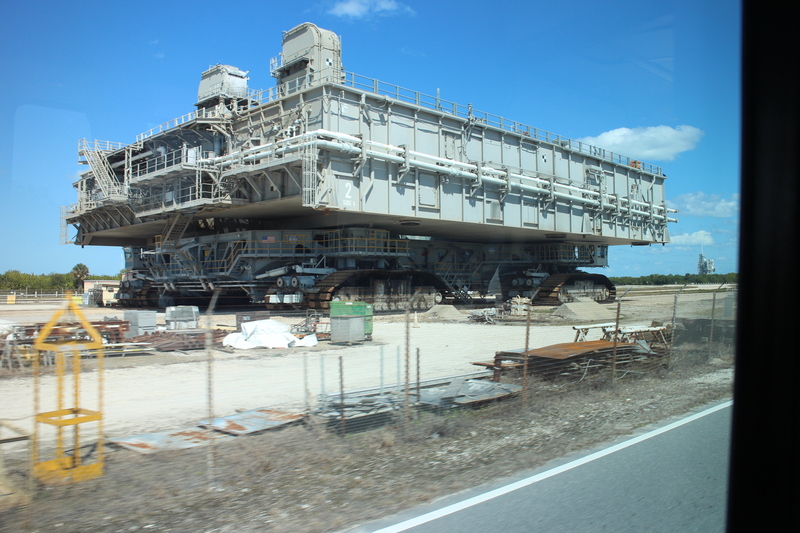 and the width of an American highway, this “roadway” as made specially for the crawler which would take the spaceship from VAB to the launch site. It was a size that was just magnanimous! Not likely to go whizzing down the top gear track any time soon! It took me a minute or two to realise, that this beast would fit through one of those doors on the VAB. ONE DOOR. (one of the dark blue bits)… THAT MAKES THE DOORS HUUUUGE! We went down and got quite close to two of the launch sites. 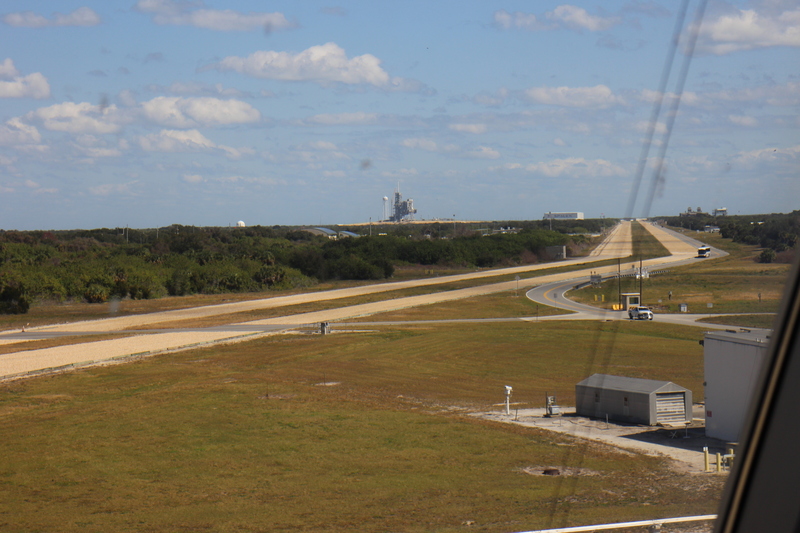 Including this one… where there is supposed to be a SpaceX launch on the Next week on Weds…. 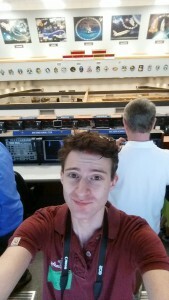 UPDATE: I thought about postponing my flights… luckily I didn’t as the launch was postponed!! 10, 9, 8, 7, 6, 5, 4, 3, 2,1… LIFT OFF! We journeyed round a bit more but there was little to note without boring you all to tears. We soon arrived at the Apollo/ Saturn 5 building… Where you go through a video/presetntation in a mocked up control room, taking you through the launch of an Apollo/Saturn Rocket… and then go into a huge hall complete with a restored (unused) Saturn 5 Launch vehicle (rocket)… It was huuuge! I couldn’t really get a picture showing how large this was! After a spot of lunch, I was back on the bus to the main complex…. 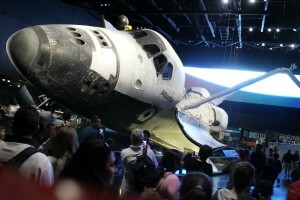 Where I went to the Atlantis exhibition. I should realised when taking this photo, that there was a critical component of it missing…. 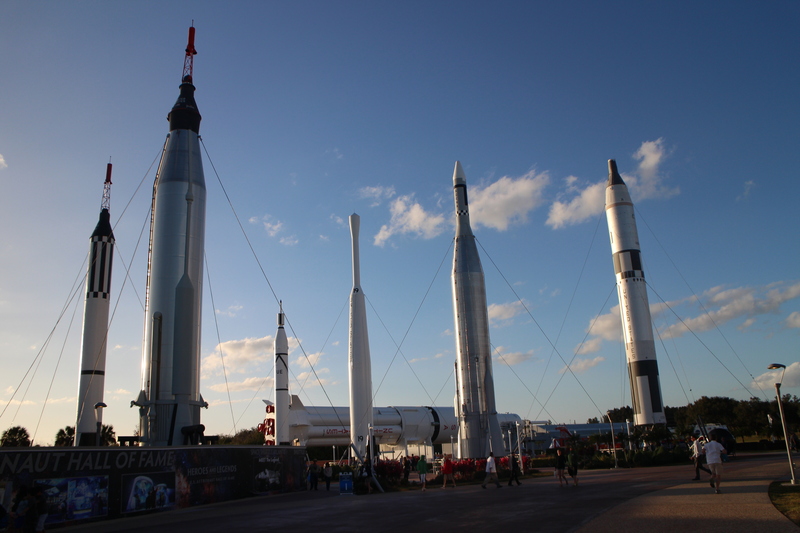 Er… Where’s the Shuttle Atlantis?! 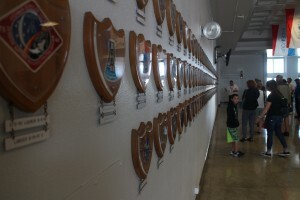 Once inside you walk round some information on the walls about space shuttle flights while slowly ascending up a slope. Eventually you come to a screening room where you see a video about shuttle launches specifically Atlantis’s missions. I clocked on towards the end, as to what was going to happen… I don’t want to give too much away but it’s a pretty impressive and spectacular unveiling!! After the screening you get to go and walk round Atlantis, and see the surrounding exhibits to do with space shuttles and the Hubble telescope as well as the international space station… and a slide which is supposed to give you a similar feeling to a landing in a shuttle?! Ah, That’s where Atlantis is! I soon threw all my worldy goods in a locker and queued up for the simulator. WOWSER. 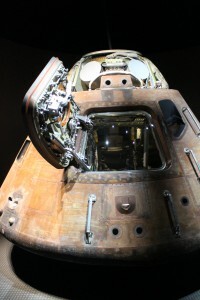 What a feeling – Not sure I’d have coped… perhaps I’ll have to put my career in space on hold! Wandering about the underside of Atlantis, was amazing how you could see each of the individual foamy looking, thermal protection tiles and their markings! 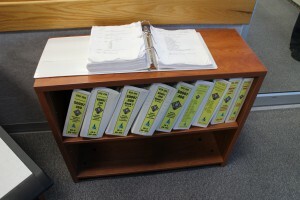 This would make Ikea assembly look easy! I managed to take a seat on a replica space station loo (as you do) as well as look at (And touch) the huuuge tyres (with purposely just the right amount of tread to save weigh!) amongst the artefacts. No shuttle exhibition would be complete without remembering those who died flying in such magnificent beasts. 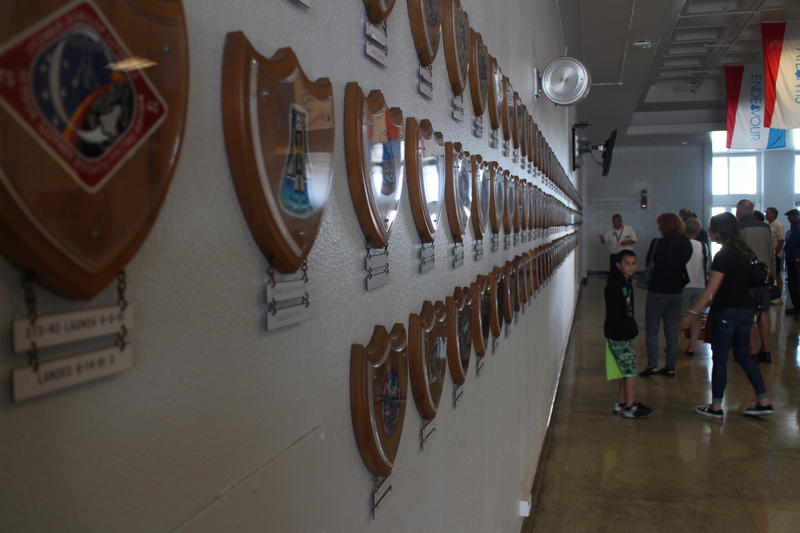 There was a whole section dedicated to those who died on both Columbia and Challenger… interestingly the longest write up was for Ilan Ramon, the Israeli who was killed in Columbia in 2003. I still remember being in Watford, in the department store that is now Primark, watching the footage on the hundreds of TVs not long after it had happened. 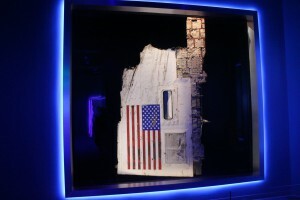 A Piece of Columbia found after it had broken up on re-entry. Having wandered through the main exhibits, all that was left for me to do was to take some photos in the “Rocket Garden” – an area of the site containing lots of old unused and refurbished rockets…. From Kennedy, I travelled down the coast a little to see Cocoa Beach – Somewhere Mum and Dad visited 25 years ago…. I went inside Ron Jon’s Surf Shop which is the largest Surf Shop in the world! CRAZY! So so so huge! From Coca Beach I set the Sat Nav to take me back avoiding Toll Roads (to make a change and to see some bits of america off the tourist trail…) To say I didn’t see much was an understatement… but there is something about driving 26 miles down a road, when you only see 2 other cars… and no junctions… AMERICA IS CRAZY HUGE!